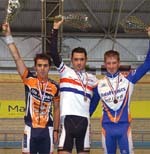 Twenty four hours after being cast as the villain in the crash which hospitalized James Taylor, Chris Newton came back to the Manchester Velodrome and put the bad memories behind him in the best way possible by winning a humdinger of Scratch Race in thrilling fashion from defending champion and newly crowned Points champion Russell Downing. Downing and Newton are two of the best finishers in the business on road and track and when they lapped the field towards the end of the race in a four man break which also included Dominic Hill and Mark Kelly, it was always more than likely that that the title would go to one or other of them. Going into the last three laps Newton, Hill, Downing and Kelly had worked their way to the front of the field and they watched each other like hawks, with Downing understandably eager to hold Newton s wheel. Despite sticking to Newton like a limpet, Downing simply couldn't find the speed to go round him when the Corima RT man struck out for the line with one and a half laps to go. The pair went through the finish in line ahead, with Kelly nipping through behind them to claim the bronze.